The video went viral in a matter of days, and has been viewed over 3 million times on Youtube. 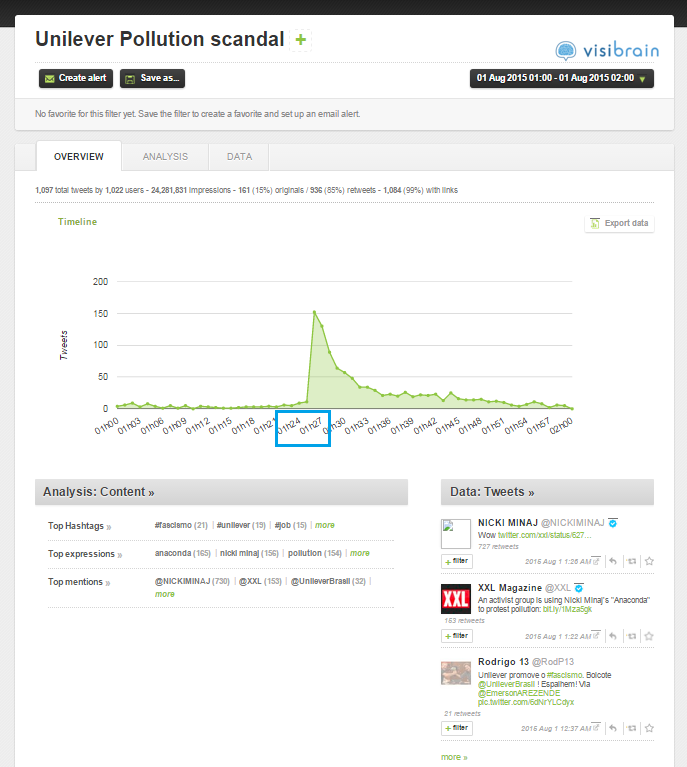 Using the Visibrain Focus Twitter listening platform, we look back on over 60,000 tweets to find out how Twitter contributed to turning the damning protest song into a crisis for Unilever. The “Kodaikanal Won’t” video was uploaded to Youtube on July 30th. However, if we look at the Twitter stream overview graph for tweets about the Unilever crisis below, we can see that it took until August 1st for activity to peak. Between July 30th and August 1st, “Kodaikanal Won’t” struggled to be seen. If we look at the most retweeted posts for the time period, few of them concern the video, and those that do gained few retweets. However, if we look closer at the Twitter stream timeline for August 1st, we can see that a significant spike in activity occurred at 1.25 am(BST). With 19,977,235 followers, one word from the rap star was all it took: by the end of the day, the tweet had been retweeted 1,355 times. The tweet gained a huge amount of visibility from the star’s acknowledgement. 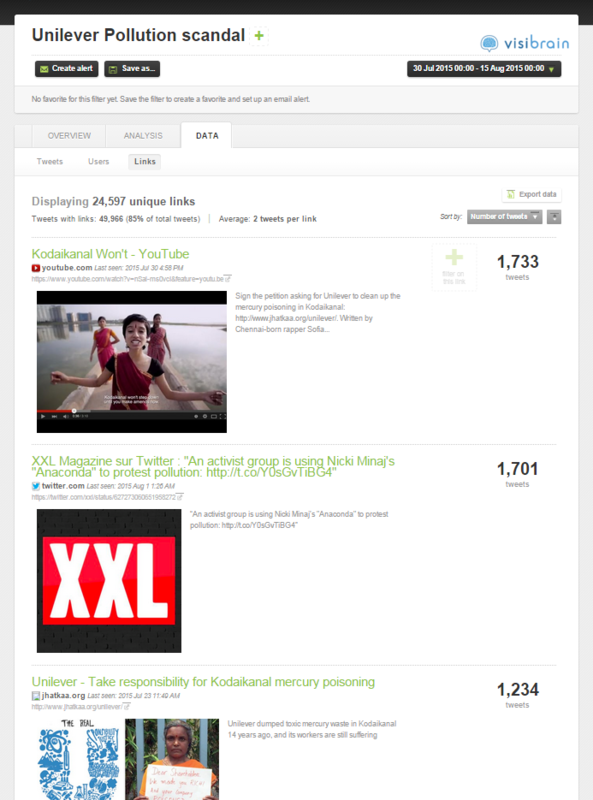 As a result, @XXL’s tweet is the second most retweeted link of the campaign. The most retweeted link was of course the “Kodaikanal Won’t” video on Youtube, retweeted 1,733 times over the first two weeks of August, which doesn’t seem like much considering the overall number of views. However, this low number can be explained by the fact that the video was not always viewed directly on Youtube. It was also embedded in a large number of popular press articles, such as this article from the New York Times, tweeted 408 times. The crisis continued to grow as top media accounts published articles and tweets, and activity remained very high until August 9th, when it dropped down to around 3,000 tweets per day for the following week. 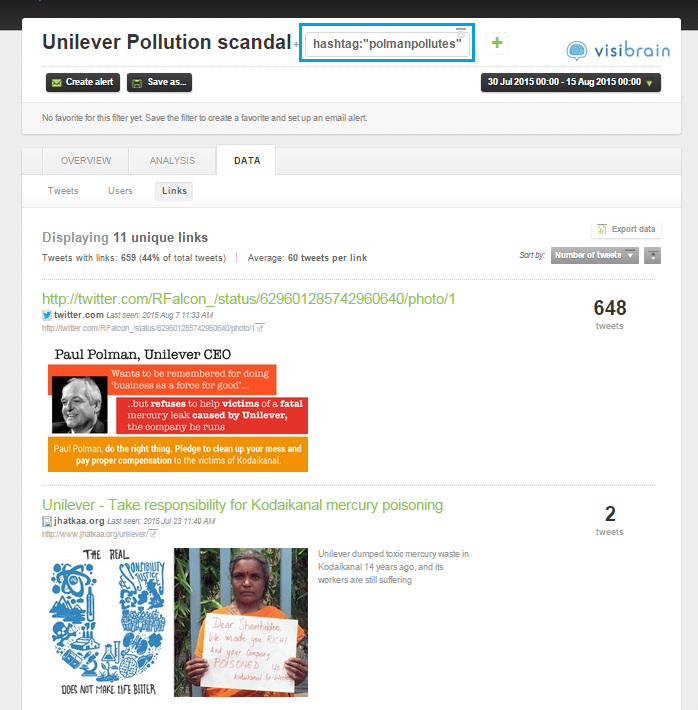 If we look at top hashtags for the Unilever crisis, two damaging dedicated hashtags that helped to spread word of the scandal shine through: #unileverpollutes and #polmanpollutes. 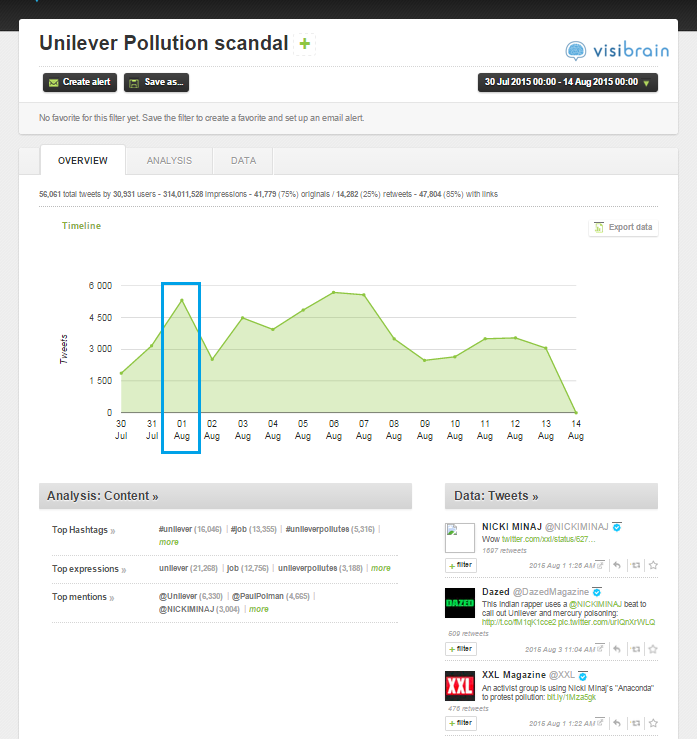 The #unileverpollutes hashtag was used 5,417 times between July 30th and August 15th. 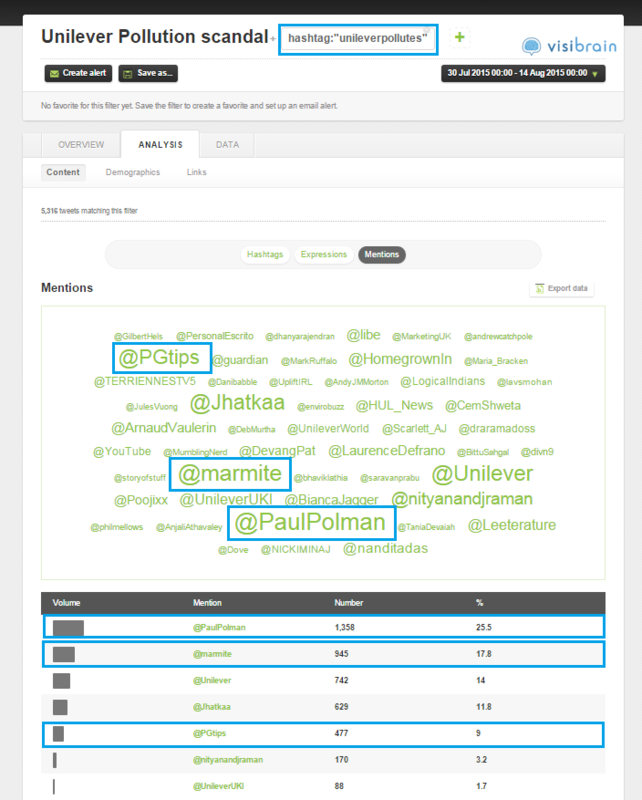 If we take a closer look at mentions in tweets containing this hashtag, we can see that Unilever brands @marmite and @PGTips are prominent. The @marmite Twitter account has over 49,000 followers, so it was an astute attempt at gaining even more visibility for the campaign. 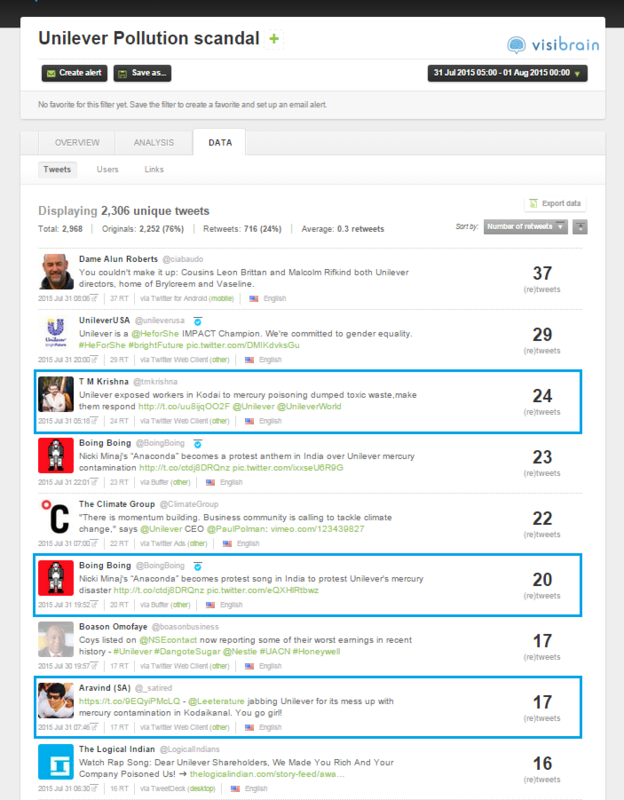 Luckily for Unilever, the tweets didn’t get a lot of engagement in spite of a high number of impressions. 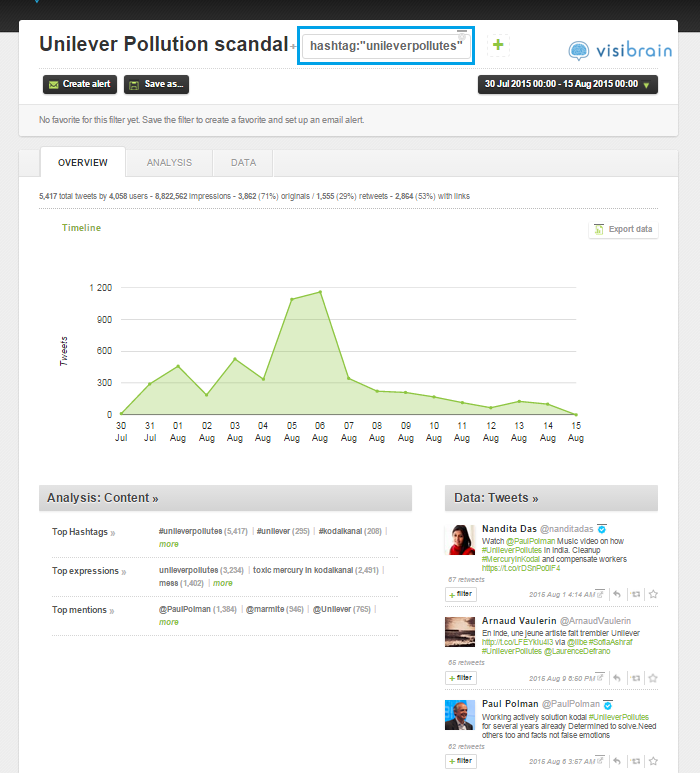 Unilever CEO Paul Polman was also affected by the scandal: the@paulpolman Twitter handle was mentioned 4,859 times over the first two weeks of August. 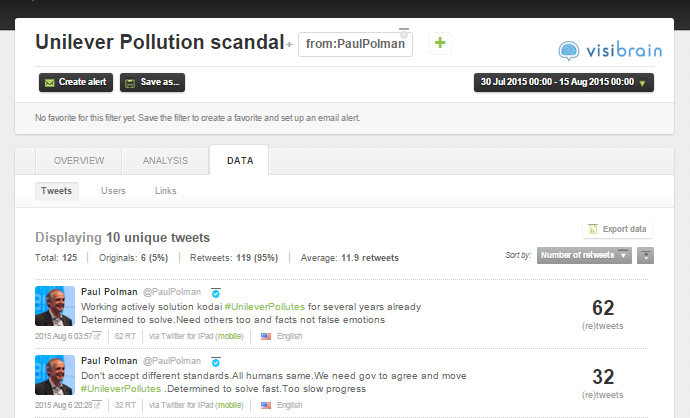 The #polmanpollutes dedicated hashtag was also used to pressure the company CEO into action, and it appeared in 1,511 tweets. The tweet was shared 648 times. Their attempts gained very little engagement however. This is because it took both accounts several days to react, which is an eternity in terms of crisis management: @Unilever tweeted about the Kodaikanal scandal four days after it broke on Twitter, and @paulpolman didn’t publish any comments until six days into the crisis. The general bad feeling toward the brand was always going to be difficult to overcome, and taking so long to join the conversation allowed the crisis to rage on unchecked. As a company that is constantly seeking to develop its image of social responsibility and good business ethics, the Kodaikanal scandal has left quite the scar on Unilever’s reputation. The crisis is a perfect example of how one word from an influencer, in this case quite literally, can turn the tables for a Twitter campaign. Sofia Ashraf’s clever choice of using backing music from a successful artist like Nicki Minaj not only made her video more appealing to the general public, it also increased its chances of obtaining celebrity endorsement and the added visibility that it entails. Once the video had gone viral, the use of dedicated hashtags helped to spread the damage even further. The court case surrounding the Unilever pollution scandal is still ongoing, so we may be seeing it again in our Twitter feeds in the future.